Please join us for our first event of the Fall semester, and our first event in the new Jenkins and Nanovic Halls! 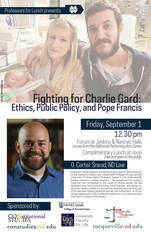 O. Carter Snead, Professor of Law at the University of Notre Dame, will present “Fighting for Charlie Gard: Ethics, Public Policy, and Pope Francis” at 12:30 pm. Find us in the Forum at Jenkins and Nanovic Halls (JNH). The Nanovic Hall entrance is located on Notre Dame Ave., just across from the Bookstore parking lot. Professor Carter Snead is the William P. and Hazel B. White Director of the Center for Ethics and Culture and Professor of Law and the University of Notre Dame. Professor Snead is one of the world’s leading experts on public bioethics – the governance of science, medicine, and technology in the name of ethical goods. He has published over forty journal articles, book chapters, and essays on abortion, embryo research, neuroethics, assisted reproduction, end of life decision-making, assisted suicide, and euthanasia. In 2016, he was appointed to the Pontifical Academy for Life, which advises the Pope on culture of life issues.